Today, like every weekday, about three-quarters of the nation’s adult workers — more than 100 million Americans — drove to work alone. It was ever thus: Americans, it seems, just don’t like to travel together. 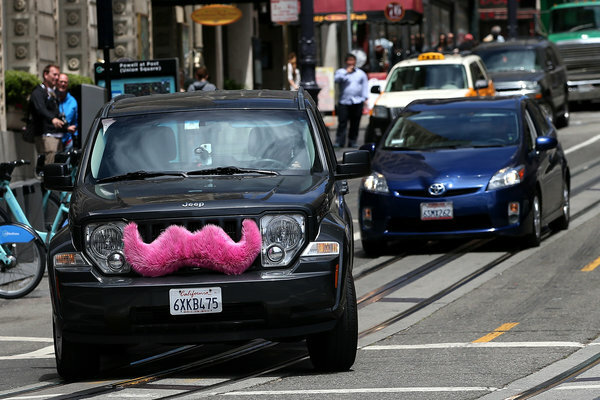 John Zimmer and Logan Green, the founders of the ride service Lyft, say they want to change that. Lyft, like its better-known rival Uber, lets you call a car using a smartphone app, and a driver who is also using the app rushes over to pick you up. This week, beginning in San Francisco, Lyft will introduce a new feature, Lyft Line, that instantly matches riders who are traveling between similar places at similar times, and offers each of them a deep discount to share a ride rather than go solo. The plan is a clever way for a car-sharing app to go beyond reducing our dependence on private car ownership — with car-pooling, it could end up reducing the number of cars on the road. he discounts offered by Lyft Line range from 10 to 60 percent off a standard ride; on average, the company expects people to save about 30 to 40 percent for sharing. These discounts would mean traveling from San Francisco’s popular Mission neighborhood to the Financial District for about $5 a ride; using standard Lyft, Uber or a taxi, the same ride might cost $9 or more.